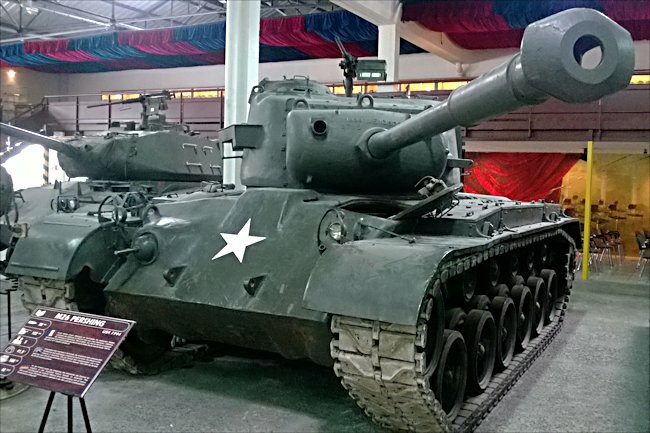 This American M26A1 Pershing Tank can be found at the French Tank Museum in Saumur in the Loire Valley. The Museum is called Musée des Blindés ou Association des Amis du Musée des Blindés, 1043, route de Fontevraud, 49400 Saumur, France www.museedesblindes.fr . The word Blindés means armoured. Even before the Allies landed in Normandy on D-Day they were aware that the M4 Sherman tank had a lot of weaknesses compared with the German tanks. Because of the Ardennes German offensive, The battle of the bulge, in December 1944 the new M26 Pershing tank was rushed to the front line. It first appeared in northern Europe in February 1945 with the 3rd and 9th US Armoured Division. It had a 90mm gun compared with the Sherman's 75mm. It had 102mm frontal armour and a crew of 5. It had a top speed of 48 km/h. In December 1944 the American 3rd Armoured Division planned to make a frontal assault on Germany’s third largest city. Cologne had been bombed repeatedly. Street after Street lay in ruins. The rubble provided the defending troops and tank crews numerous positions in which to ambush the approaching Americans. The M4 Sherman tanks were out gunned by the Germany Army’s Panther and Tiger tanks. Their armour was useless against the feared anti-tank 88mm gun. The Germans did not realise that the Americans would be attacking with a new weapon. The M26 Pershing heavy tank had been rejected by planners earlier on in the war and instead they had gone ahead with the production of the cheaper and a less heavily armoured M4 Sherman believing it was up to the job. It was only after the disastrous battle reports filtered through back to America did the go ahead for the M26 Pershing to be produced happen. It was known at first as the T26E3. It had 100mm of sloping front armour and a lethal 90mm main gun with a killing range of 15,000 meters. The Pershing tank had not let been tested in an urban environment. 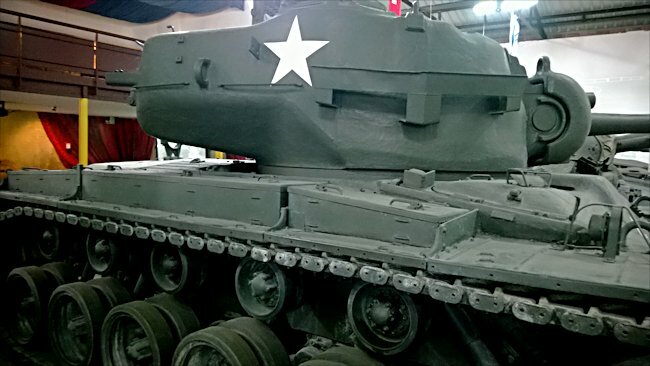 On 6th March 1945 this new US tank received its baptism of fire on the streets of Cologne. The tank crews were guided by the towers of the still standing medieval cathedral of St Peter. As they neared it their progress was halted by a German Panzer V Panther tank. It was armed with a smaller 75mm high velocity long barrelled that could hit targets over 1,000 metres away. It had only 80mm of frontal armour but slopped it became effectively 145mm thick. It fired and knocked out one of the M4 Sherman tanks with a single shot. Three of the five crew died. To defeat the enemy tank the Pershing must out flank the panther. The M26 Pershing tank was equipped with a gyro stabiliser; a device that enabled the main gun to be fired with accuracy even whilst the tank was moving. This was very new radical step change technology. The Pershing tank commander used this new ability to the full. He had gone around the block and now appeared on the right of the Panther tank that was busy engaging the Shermans. He kept on going over his crossroads and fired on the move as soon as the Panther came within view. It found its target. The commander fired a second time that that also found its target even though the tank was driving over rubble strewed streets that gave a bumpy ride. After the third on target shot the Panther burst in flames. By 7th March the Americans had moped up the last pockets of resistance and Cologne and its defenders surrendered. On the same day the crucial bridge over the Rhine was seized at nearby Remagen, still in tact. American Armour was soon pouring over the bridge to the eastern side of the River Rhine including tanks from the 3rd Armoured Division. The Americans were now less than 600km from Berlin, but between them and the German capital lay the industrial Rhur valley. There were over 500,000 German troops determined to fight back at all costs. The attack on 23rd March 1945 would be a classic pincer movement with the 9th US Army attacking from the north and the 1st US Army attacking from the south. If they succeeded over 350,000 soldiers from Germany’s Army Group B would be trapped. The problem for the Allies was that the Germans were led by one of the finest defensive Commanders of the war, Field Marshal Walter Model. To defeat him the Americans had to defeat his panzer forces. The 3rd Armoured division were ordered to make a dash to the city of Paderborn. Tank commander Cpl. John Irwin remembers, "Paderborn was a very important post for us. That is where the main panzer schools were. That is why we were headed up in that direction." The Americans feared that the Germans based at the training school would mount a counter attack. The city had to be captured and quickly. Cpl. John Irwin continued, "This drive was of 90miles about 140km through enemy held territory. We did it in one day." It was the longest recorded one day US armoured formation push in World War Two. On 30th March 1945 a unit of fifteen Shermans supported by a M26 Pershing from the 3rd Armoured Divisions 32nd Armoured Regiment spearheaded the assault with the Pershing at the front. They were being shelled on the road by a large German gun. The Pershing used a high Explosive HE round to put the gun out of action. The gunner loaded another HE round just in case they came across another gun covering the road. In their haste to get to Paderborn they did not realise they had driven straight past a group of five German Panther tanks who started to follow them with clear shots to the rear of the American tanks. The crews only knew they were in trouble when tanks around them started to catch fire after being hit in the back. The Pershing crew heard over the radio. They moved their turret around as fast as they could to face behind them and fired at the Panther tank head on whist still moving forward. The HE shell did no damage. They loaded an armoured piercing shell into their 90mm gun and scored another direct hit whist on the move, dead centre on the German tanks strongest section of frontal armour. It went straight through and destroyed the tank. No Sherman tank could do this. Only the Pershing and one Sherman survived the engagement. After three days of stiff bloody fighting the Americans were able to over whelm the defenders. They surrendered on 1st April 1945. That same day the Americans competed their encirclement of the Rhur and sealed the fate of German Army group B. The commander of the defeated German forces Field Marshal Walter Model committed suicide rather than surrender. The capture of the Industrial Rhur region of Germany crippled their ability to manufacture more tanks, aircraft and other weapons. The days of the Third Reich were now numbered. 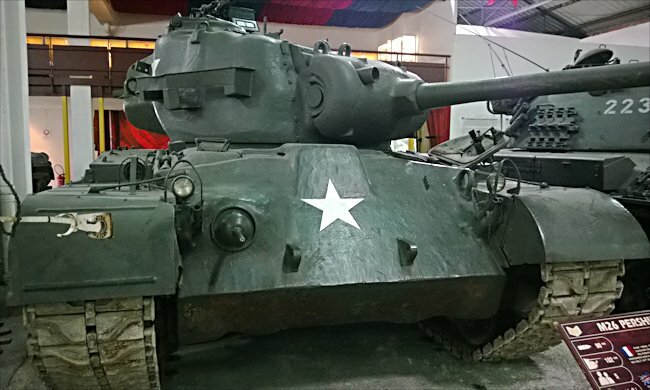 Where can I find other preserved M26 Pershing Tanks?